Recumbent bikes are widely popular in the fitness market because they provide a steady lower body workout while allowing you to recline comfortably on the seat so you can pedal away with both your hands free. The Exerpeutic 400XL Recumbent Bike is not completely recumbent and is more of a semi-recumbent piece of machinery which means that it is a hybrid between an upright bike and a recumbent bike, and as a result it is designed as such. In the market, compared to other bikes of the same order, it comes quite cheap. But do not let its cheap price tag give you the wrong idea that it isn’t worthy of a long term investment. Fair to say, the 400XL provides all the winning traits of a really decent recumbent bike that accommodates comfort with affordability and can prove to be an adequate investment for the years to come. Read this review to find out more about what makes the 400XL a model worthy of owning. The Exerpeutic 400XL Recumbent Bike amounts to dimensions of 33”L x 19”W x 46”H. Although the bike is lightweight (weighing at a meager 39 pounds) and foldable, it is capable of sustaining heavy use as per most user reviews. The bike itself has a capacity to accommodate users up to 300 pounds which is pretty good as most people of different weight types can use this recumbent bike for their workout purposes. The entire bike is made of a steel tube framing which is quite sturdy without the risk of it rocking or tipping over when in use. 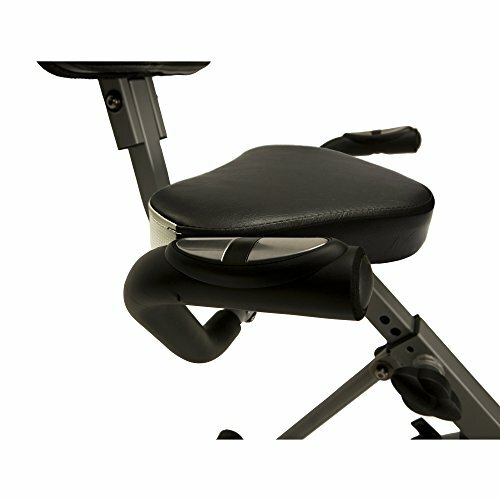 The ergonomic recumbent seat is designed in such a way that it plays a good job at reducing pressure on the lower back and other spots that frequently ache during long workout sessions on other machines thus making the 400XL a very good choice for users who are susceptible to troublesome aches and pains. Although one small complain the recumbent bike warrants is that it does not come with levelers that could balance it on uneven surfaces. However, a smooth floor or a thick carpet will be more than enough to keep the bike in its place without chances of wobbling. The Exerpeutic 400XL is quite compact and does not take a lot of space. After all, it is only 19 inches wide. Because it is foldable, you can tuck the machine every time it is not in use and can safely place it in storage spaces. Built in transport wheels at the base of the bike make it very easy to move around from one place to the next. The console of the 400XL features a modest 3.3’ x 1.5’ LCD screen that tracks vital readings during your workout session. The LCD display shows distance (miles), odometer, time, speed (mph), calories burned and heart rate especially when your hands are placed on the pulse sensors of the handlebars. The LCD also gives you the freedom to choose between seeing one specific reading, or if you so wish, you can set it to scan through the numbers after every six seconds. However, the LCD screen is not backlit which is one recognizable flaw as it will be difficult to make out your readings in situations where there is lack of natural light. Owing to its low price tag, the Exerpeutic 400XL Recumbent Bike understandably does not come with any pre-set workout programs. Because of this, the bike does not store your individual workouts. To keep a track of your workout progress, you will have to manually note down your readings elsewhere. However, the odometer does keep a record of your cumulative distance ridden which makes the process a little more convenient if not altogether easy. Underneath the console there is a knob that lets you select between 8 different resistance levels. This moves a magnetic pad closer or further away to increase/decrease the total resistance. Markings on the knob help determine what resistance level you have set the bike in. As you increase the degree of resistance, the overall tension increases in increments and as a result you’ll have to apply more force in your pedaling. This freedom to adjust resistance adds extra flair to your workouts and can help change the intensity as per your requirements. Because of the expertly crafted ergonomic design, the bike’s seat can recline comfortably. 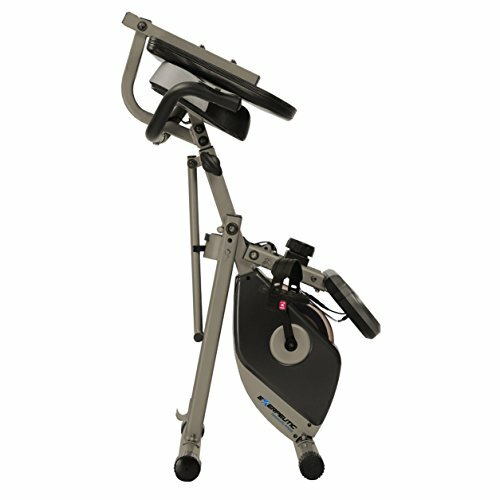 This model of the Exerpeutic is designed with a horizontally adjustable semi-reclined seat that allows for better body positioning during workouts and reduces back pain and risks of injury. The seat is also adjustable with the manufacturer guaranteeing that it can easily accommodate users between 5’2” to 6’2” heights. To adjust the length, there is a knob beneath the seat that can be adjusted and which helps move it up or down to coordinate the user. The 400XL also comes with a V-belt drive system that helps provide a smooth riding experience with the grips on the pedals and the precision-balanced flywheel lessening the likelihood of the user slipping. The drive is also very quiet and doesn’t require a lot of maintenance. The pedals of the bike provide a firm grip and are made from a sturdy plastic that minimize chances of slipping. There is a strap that goes over the shoes to hold them in place to ensure better safety. Upon shipping, the bike comes with the bulk of the parts already assembled with the user having to do nothing more than attaching only the handlebars, seat, seat post, pedals and console to the bike. With the help of the instructions manual or a couple Youtube videos, you’ll have figured it out in no time. The overall assembly should not take longer than 30-60 minutes for a single person to complete the task alone. 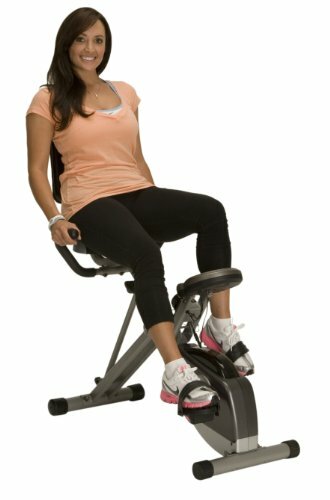 Sure, the Exerpeutic 400XL may not be the ultimate dream semi-recumbent bike for the fanatic exerciser but for its really feasible price tag, smart design, and capacity for heavy use, it is a great option for those with small apartments or home gyms who only want to have a good time and also undergo lower body workouts while they are at it. It may be tame in comparison to other higher-end model recumbent bikes but the 400XL easily offers everything within its price tag and maybe a little more than that too. The Exerpeutic 400XL is designed with portability and space efficiency in mind and does a good job in both of these areas.